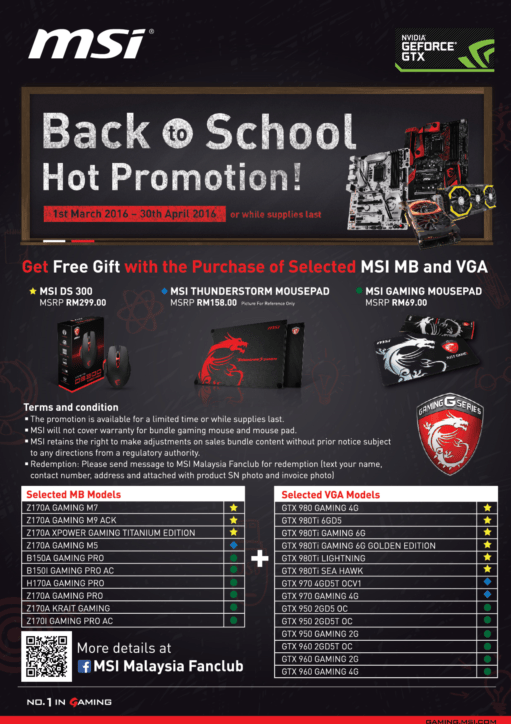 MSI Malaysia just announced an MSI Back to School promotion, where MSI fans in Malaysia get to go home with free gifts with purchase of selected MSI motherboards and graphics cards. Depending on the MSI motherboard or graphics card you purchase, you get to go home with either the MSI DS 300 gaming mouse (worth RM 299), an MSI ThunderStorm mouse pad (worth RM 158) or an MSI Gaming Mousepad (worth RM 69). Previous : Honor Malaysia Has A New Home! Such lame gifts. Why are MSI using low tech? All systems should have IPS FULL HD screens to 3K, SSD, USB 3, SKYLAKE 6 GENERATION INTEL. Don’t waste your money on MSI low tech products.